There is no doubt that the tragic events of 9/11 changed the world. In response to the attacks in an effort to transform pain into collective power for good, 9/11 Day was born. 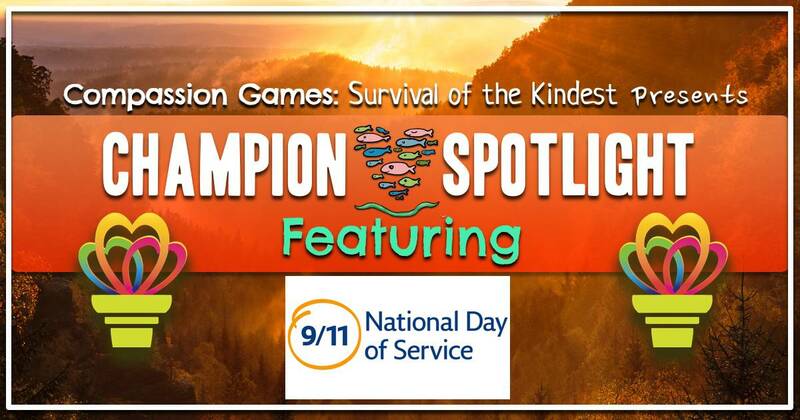 We are honored to recognize 9/11 Day as a Champion of Compassion. The September 11 National Day of Service, or 9/11 Day, is a national volunteer day and annual event taking place on September 11. To go deeper behind the origins of this day is to know that it was the passion and dedication of two friends, David Paine and Jay Winuk, who worked together for years to make this happen. The 2017 9/11 Day has some incredible ways you can get involved and up your service and compassionate actions through honoring this day of remembrance. 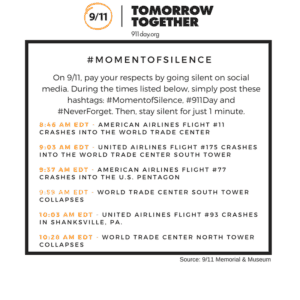 Join the #MomentOfSilence Campaign by sharing this moment of silence image on 9/11/ Day and be in silence with many remembering across the Country. On Monday, September 11, 2017, we’re asking Americans to observe one or more of the moments of silence, staying silent on social media for 60 seconds at each time. Another way to honor this Champion of Compassion Organization is to take action and help with our friends in Houston, Texas in Hurricane Harvey Relief support. Check out 9/11 Day site to see ideal resources on ways to help from wherever you are on the planet. 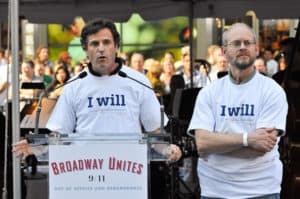 Founders of 9/11 Day David Paine and Jay Winuk speaking on behalf of 9/11 Day at a Broadway Unites event. These two friends, David Paine and Jay Winuk, who lost his brother Glenn Winuk in the 9/11 attacks, have dedicated the better part of their lives over the past 15 years working to transform 9/11 from a day of terror into a day of compassion and good. In 2009 the U.S. Congress and President Barack Obama joined together to pass bipartisan national service legislation that formally designated September 11 as a National Day of Service and Remembrance. The mission of 9/11 Day is to keep alive the spirit of unity and compassion that arose in the immediate aftermath of the September 11 attacks. Annually, in New York City, 9/11 Day has over 2,000 volunteers packing 500,000+ meals for needy families, seniors, and military veterans. You can help and volunteer in NYC, or donate any amount by going here. We encourage you to connect to 9/11 Day and share your service for others on the Compassion Report Map, amplifying the compassionate world we live in together with Team 911 Day.